AT&T’s version of this device isn’t going to be dramatically different from the one Verizon released in January. What makes it significant is that it will bring the webOS to a third wireless carrier in the U.S. The Pre Plus offers a 3.1-inch, HVGA, capacitive touchscreen, HSPA 3G, Wi-Fi, Bluetooth and a sliding keyboard. It is a decent device, but would be better if it had a larger keyboard. Care to help Palm make a positive headline? 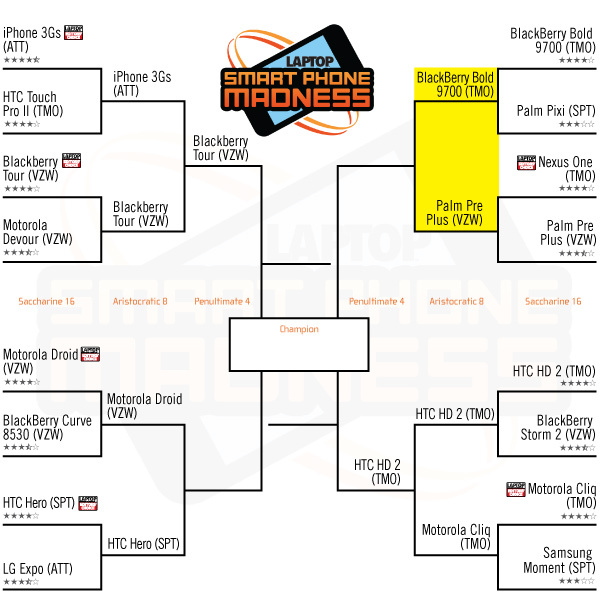 the Palm Pre Plus is now up against the RIM BlackBerry Bold 9700 in Laptop Magazine’s March Smart Phone Madness contest. Let’s help give Palm some good news to write about and push them into the Final Four. Check out this great price for the Palm Pre Plus. It looks like Palm may be trying to get back in the mobile game after releasing poor sales of the Palm Pre, by partnering Sprint for a new WiMAX mobile phone reports an article over on softsailor. Originally HTC was to partner Sprint in the WiMAX game, so this new revelation that Palm is now going to be the Sprint WiMAX partner may surprise some although they do share a common past.